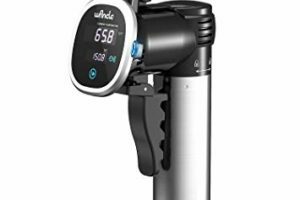 After making its debut on Amazon in March of 2018, the Wancle sous vide immersion circulator has quickly racked up over 500 reviews for an overall rating of 4.4 stars. I will confess that I had not heard of the brand until fairly recently. Here’s our Wancle sous vide review so you can see what all the hype is about with this model. 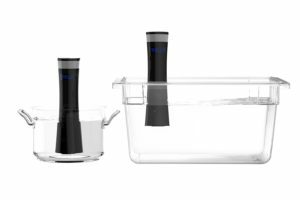 First, this sleek unit is listed on Amazon with this very long name Wancle Sous Vide Precision Cooker, Thermal Immersion Circulator, with Recipe E-Cookbook, Accurate Temperature Digital Timer, Ultra-quiet, 850 Watts, Stainless/Black. 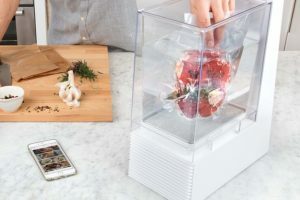 It does hit on some of the key features of the model: it is 850 Watts, it’s known for accuracy, and it’s also one of the quietest sous vide machines you can buy. In addition, it claims to be able to reach 140 F in only 15 minutes, compared to other units that will take upwards of half an hour to reach that temperature. Build quality is often cited as one of the standout features of this circulator. Some things you should know about the Wancle sous vide machine. 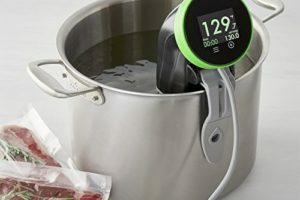 First, this immersion circulator does not have Bluetooth or WiFi capability, which the company literature says allows them to focus on creating an even better sous vide machine. This may or may not matter. I am not a big user of smartphone apps related to my sous vide cooking, but that is an important feature to a lot of people. Possibly a deal breaker. Also, even though the ratings on Amazon right now are overwhelmingly positive, there are some problems that have been reported. It’s supposed to be an extremely quiet unit but some have said that is absolutely not the case, based on their experiences. In addition, quite a few customers have reported having trouble after two or more uses. Some have had out-of-the-box trouble with it operating properly. Holding or reaching temperature is also an issue in some cases, with some saying it worked great at first and then lost the ability to reach temp after several uses. Currently, 71% of reviewers rated the Wancle sous vide immersion circulator at 5 stars. A rating of 4 stars was given by 14% of customers. Reviews of 2 or 3 stars were given by 6% of users. And finally, 9% rated it at one star. Looking at the positive reviews, it do not get that suspicious feeling that sometimes come from Amazon reviews these days. That is, it seems like these are legitimate reviews rather than the paid or semi-paid/free merchandise positive reviews that we all hate. Some people mentioned buying it on a lightning deal price. 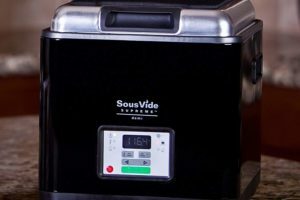 Our overall Wancle sous vide review: for the price, I’d definitely be interested in picking up one of these as a starter unit or possibly as a second machine to use for large cooks of multiple foods.